Rachel McAdams and Rachel Weisz in Disobedience. When a movie falls through the cracks, The Canadian Crew catches it in a yearly section called The Lightning Round. 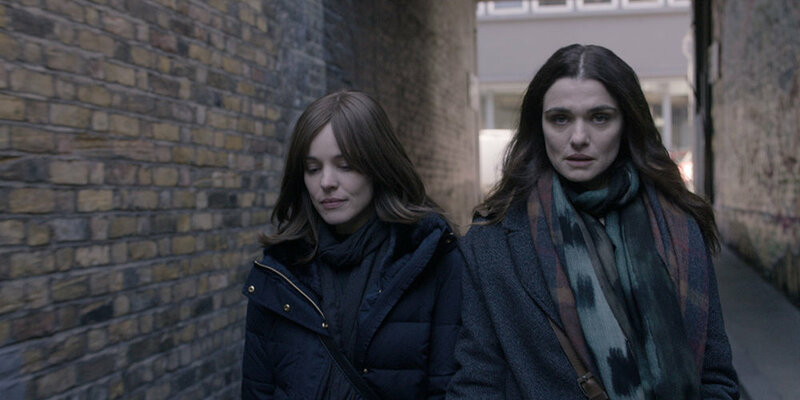 Disobedience (UK, 2017): Understated drama about two women coming to terms with their sexuality within a Jewish Orthodox community. It doesn’t obey any of the clichés this subgenre has us used to. Downsizing (USA, 2017): By far director Alexander Payne’s worst film to date, it has plots for about five movies, all undercooked. Oh, Lucy! (Japan/USA, 2017: Slight and tonally awkward. I wasn’t expecting Josh Harnett (of all people) to pop up in a Japanese movie. The Crescent (Canada, 2017): Imagine The Others, but boring and badly acted. It looks otherworldly, but desperately needed a better plot to go with the visuals. The Summit (Argentina, 2017): There are two plots in this film: Political intrigue among Latin American countries, and the daughter of a president acting crazy. The former is far better than the later, but the movie focuses on the wrong one. Cocaine Prison (Bolivia, 2017): Underdeveloped country chooses to punish drug traffic small offenders over the infinitely more powerful kingpins. It personalizes the problem without forgetting the context. Not bad. Princesita (Chile, 2017): Twelve year-old girl lives in a cult, gets a taste of the outer world, wants out. Noteworthy allegory of the oppression of the patriarchy, with a truly horrifying, artfully shot sexual violence sequence. Let the Corpses Tan (France, 2017): The story of a robbery gone wrong embodies everything wrong with the Midnight Madness program this year. Weird for weird sake, barely competent filmmaking and ultimately, a pointless enterprise. mother! (USA, 2017): Masterpiece. We’ll be talking about it for years. Happy End (France, 2017): Michael Haneke’s weakest effort in years. Family alienation was better dealt with in Caché. Jim & Andy: The Great Beyond (USA, 2017): A glorified behind-the-scenes doc from the time Jim Carrey interpreted Andy Kaufman in Man on the Moon, this doc has great footage but loses its way trying to pretend is deeper that it actually is. The Shape of Water (USA, 2017): A beautiful, dark fairy tale from Guillermo del Toro featuring a man-fish and Sally Hawkins. It certainly has its virtues, but I was less blown away than most people here. Three Billboards Outside Ebbing, Missouri (USA, 2017): Martin McDonagh relies less on his sharp dialogue and more on his character building skills in this black comedy with a heart. Frances McDormand and Sam Rockwell use their well-honed personas to great effect. The China Hustle (USA, 2017): Apparently, investing in China is a terrible idea. Dense but important doc. Borg/McEnroe (Sweden, 2017): In theory opposites, the cool-as-ice Swede and the hothead American came from the same place. Well-made and ntertaining, although I ended up wanting to watch a Vitas Gerulaitis biopic. Revenge (France, 2017): We live in 2017, do we really need to take ideas from I Spit in Your Grave? This is not feminism, it’s exploitation disguised as feminism. TIFF 2017 overall: Three stars. The movies were average, but the parties were fantastic.